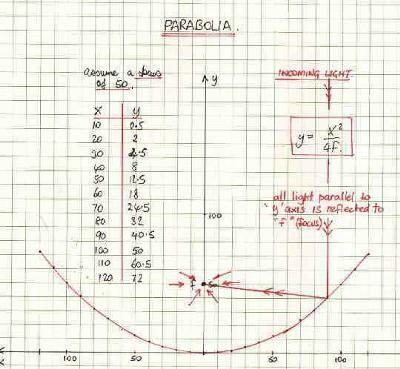 My experiment with the parabolas continued throughout the weekend (in between football games, of course). Although I had created a set of parabolas that did a great job focusing the Sun on a tight area, the target area was directly on the knob of my coccotte, and would be for any top-handled pot. My results were getting better, but they still were not spectacular. Too much energy was hitting the top of the cooking container, and not enough was contacting the sides. One of the great things about Global Sun Ovens and other solar ovens, is the worry-free, uniform cooking that takes place. One of the great things about parabolic cooking is how fast you can get your burner up to frying temperatures. I was kinda stuck in that middle ground. Although making a few solar bows is unbelievably fast and inexpensive, I was admiring the balance that Jim LaJoie had achieved with his ASSC design. Thinking of one more trick, I relaxed one of my solar bows, and used it's wire as a way to hang it above the tighter-angled base-bow. This actually worked very well because that increased width focused the Sun on a broader area than the base bow. My cooking performance was better, with the oven thermometer within the coccotte reaching well above 200F (with no heat sink, like food, to retain the heat, and without a polycarbonate bag to create an insulation area). I'd say this "Solar Hut" is worth a try, especially for kids that want to make a project and show their grasp of graphs, differential equations, algebra, optics, etc. Moving the bows around, did create a problem, as the tightest one (the one I had as the base) popped with the tension. Once I lost that perfect parabola focus, the heating wasn't the same. The results were more like the Cookit or other panel cookers after that. A lot of sun was wasted with inefficient angles. In conclusion, I'd say that the technique of bowing a panel that contains some tension, to form a parabola, is what I'll take away from this project. I'd say it's an easy experiment in solar cooking for younger people who don't have access to woodworking tools, and specialty materials (glass, insulation, spray paint, polycarbonate,etc). 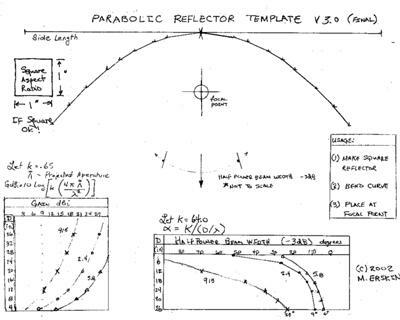 The light concentration is not as dangerous as shallow parabolics that concentrate light outward to a fixed point beyond the curved edge of the device (but you are concentrating the sun and have to be aware of your eye wear and sight-lines). The results are superior to any pizza-box, Pringles can, aluminum foil cardboard projects I've seen bouncing around the Internet. For me, it was fun, and different. Thanks to the readers for following along. This was very well thought out and tested. 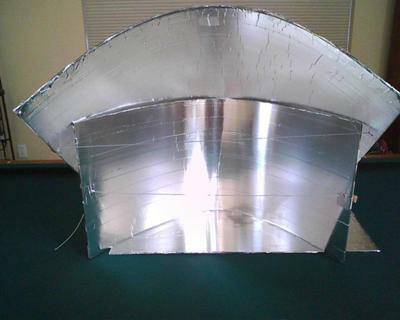 Great information on how to build a homemade solar cooker. I especially like the way you describe and explain your methods, processes and results, very clear and articulated. Thank you for contributing, and feel free to do so whenever you wish. You are absolutely right. Solar cooking for inventors is all about experimenting and, with luck, taking away good information to use in yet a better design. The basics are so simple... you can reheat a burrito in your windshield - but the performance/convenience balance factor is more elusive.